Yesterday, Blizzard posted not one, but three separate blogs to the Heroes of the Storm site. Two of them are Designer Insights and the third is an update for what's currently in development. 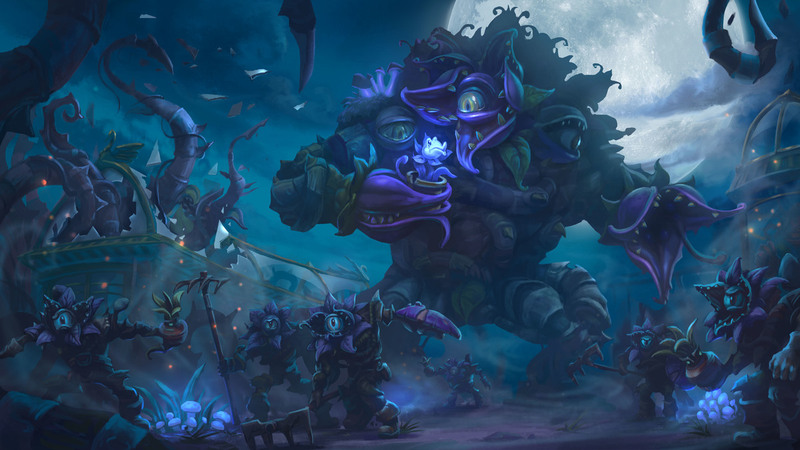 Heroes of the Storm is the MOBA Blizzard has been working on that features heroes based on the Warcraft universe, and is still currently in beta. At PAX East, Blizzard showed off Master Hero Skins, which are skins that are part of each hero's evolution. Blizzard plans to release a series of videos leading up to Master Skins being released in game. The first video features Arthas, Li Li, Stitches and Falstad. If you've played World of Warcraft, you've already run into these guys. The best part of the whole video is seeing Stitches in a purple crown set to some jazzy, upbeat game music. I'd love to see these evolved versions of heroes make their way into other Blizzard games. Garden of Terror is a new battleground for HofS, which has a pretty neat mechanic from the get-go. The game will feature dynamic lighting, and Garden of Terror will be a battleground that highlights it. When darkness falls across the garden, players' vision becomes dulled, making players pay closer attention to what is happening around them and where they are. In the garden, players collect seeds from Infected Servants and the Flowering Shambler. At 100 seeds gained, a player can turn them in to the Fertile Soil to become the Garden Terror. Basically, the Garden Terror is this uber badass that just runs through and wrecks house. You want to be the team that gets that guy first. The third blog from yesterday is an in-depth analysis on Zagara, the Zerg Broodmother. Pulling from proper StarCraft lore, Zagara's abilities are all based on summons, including summoning zergs that can possibly overwhelm waves of minions. She and her loving children can also poop out pustules that will pop and cover parts of the ground in a purple goop that will grant her a speed buff. This mechanic will surely be something that if, utilized well, will set average and awesome players apart. Zagara has quite a few builds that can change her play drastically. Richard Khoo goes over his recommendations for effective builds. Super-extra-bonus news: the day before these blogs went up, Blizzard let us know that on the 22nd they will be holding a live Q&A on their Twitch channel regarding the next patch. You can submit questions now via Twitter. To learn more, see their small article about the live stream.